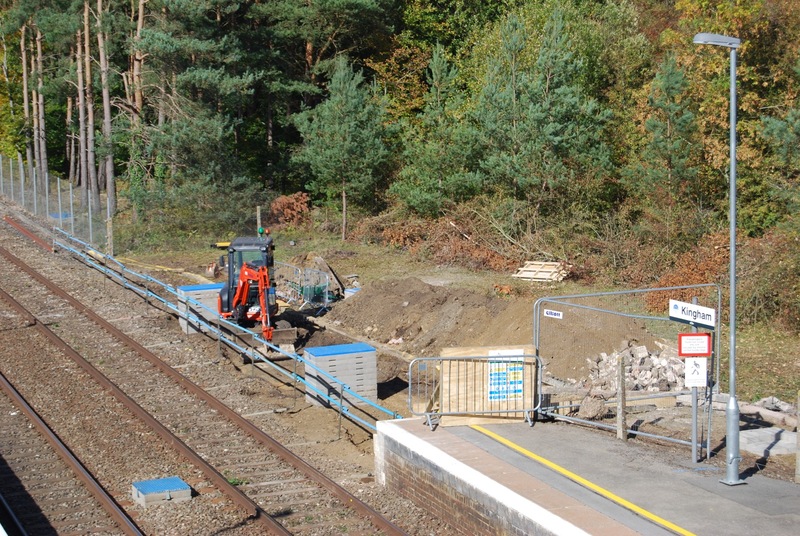 Work to extend platforms at stations along the Cotswold Line is now under way, with contractors beginning work at Kingham station in West Oxfordshire. While most platforms will be lengthened to accommodate seven of the 26-metre-long coaches, at Kingham just one platform is being extended to match the length of the other. This will allow doors to be opened on six coaches of nine-car and 10-car IET formations when they call at the station in both directions. The ramp at the north end of platform 2, which is used by trains towards Oxford and London, was removed in the last week of September and ground cleared for the foundations of the extension. New drains had already been installed on Friday, September 28, when the photograph was taken. Click here for more details of the project and work to be carried out at other stations, including a closure of the Cotswold Line between Moreton-in-Marsh and Worcester between Saturday, November 17, and Sunday, November 25. Trains will contine to operate between Moreton-in-Marsh, Oxford and London.